After three years of deadlock (2015-2017), India starts again the exports of dairy products, which between January and December 2018 increased by 136.5%, driven almost exclusively by Skimmed Milk Powder (SMP) and Butter. Lower SMP unit prices contribute to the sharp acceleration of exports, particularly in the month of December, when the Skimmed Milk Powder dropped to 1.66 $ / kg (-40.9%) and the export increased by + 2,874.5% in quantity and + 1,656.5% in value. Is not only the logistics that orient the international trade of a country that for years in the dairy sector has pursued a logic of balance and focused only on domestic consumption, but obviously also politics. The export of SMP sees Bangladesh, Malaysia, Afghanistan, among the first countries of destination, as well as Pakistan, with a 10% market share and an increase of 3,484% in December and of 640% in the 12 months of 2018 y-o-y. Will the trend continue even in 2019? In 2018 Indian Butter also had a golden period for exports, with an increase of 118.3% in quantity and 81.1% in value, which is close to 148 million dollars. Egypt, United Arab Emirates and Saudi Arabia are the top three destination markets, with a 57% market share. After the Middle East area (another geopolitical opportunity?) there are the United States, which imported from India almost 1,500 tons of Butter in 2018. 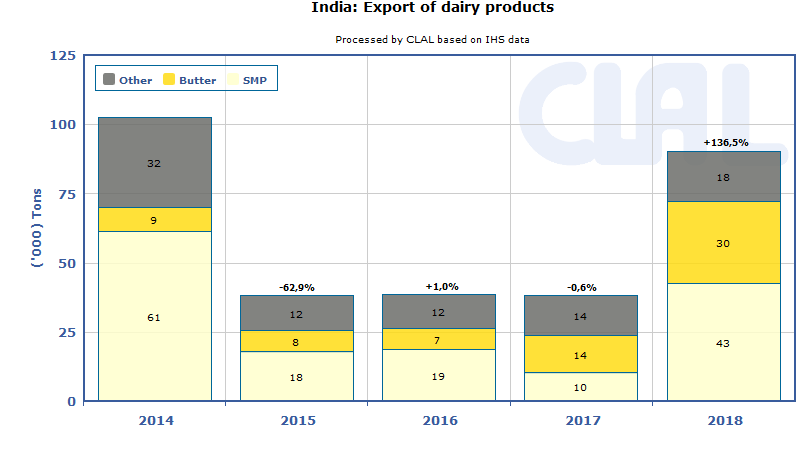 Overall, India’s dairy exports are still limited (just over 90 thousand tons), but it is a signal to keep in mind in the medium-long term considerations.